The installation document for the Open Computer Forensic Architecture was mostly accurate. However, I ran into some issues. Posts labeled OCFAInstall are supplements to the OCFA on Debian installation documentation which can be found (once OCFA is downloaded) in 'ocfa/doc/usage/install/HOWTO-INSTALL-debian-etch.txt' - Direct download links, a bit more detail in some areas, as well as some troubleshooting advice to issues I ran into is given. 1) To avoid future confusion, don't name your machine simply 'OCFA'. Try 'OCFAServer' or the name of a greek god. 2) Do not create a user named 'OCFA' - one will be created automatically later. Now scroll to 'Use as' and hit enter: This is where you set the file system (xfs, ext3, swap). Scroll down and choose 'swap area'. Once done, scroll down to 'Done setting up the partition' and hit enter. 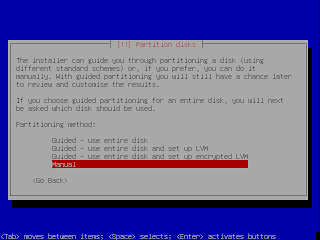 e 'write changes to disk', and your partitions are done. In the Software selection section I chose 'DNS Server, File Server and Standard System' - I don't think there is really a need for a Desktop environment, unless you are using this as a workstation as well.